l Cross Clamp also available to connect Galv. Plate with 40 mm width. 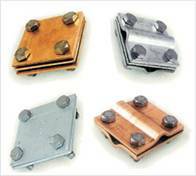 l Cross Clamp also available in size 60 x 60 x 3 / 60 x 60 x 4.
l Cross Clamp also available of Stainless Steel on special request.